Humayun Tomb. 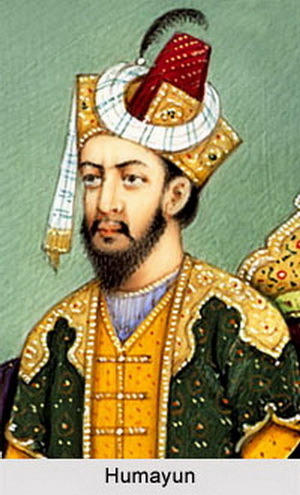 Humayun was the eldest son of Babur died in the year 1556. His most beloved wife and chief consort Bega Begum built the most splendid and beautiful mausoleum in memory of her husband. Nine years later Bega Begum commissioned to build massive mausoleum in the year 1565. It is located in Nizamuddin in East Delhi and is declared as UNSECO world heritage site in the year 1993. This is one of the few well preserved Mughal monuments in India. On 20th January 1556 Humayun died and his body was buried in Purana Quilla in Delhi. After the attack from Hemu, chief minister of Adil Shah Suri on Delhi, Purana Quilla got damaged. Humayun’s wife ordered for the mausoleum. She employed the services of a Persian architect called Mirak Mirza Ghiyas. The construction costed close to 1.5 million Indian rupees at that time which the Bega Begum entirely took care off. Before the completion of the mausoleum, Mirak Mirza Ghiyas died; his son Sayed Mirza completed the mausoleum. The beautiful tomb is in the centre of a square garden. 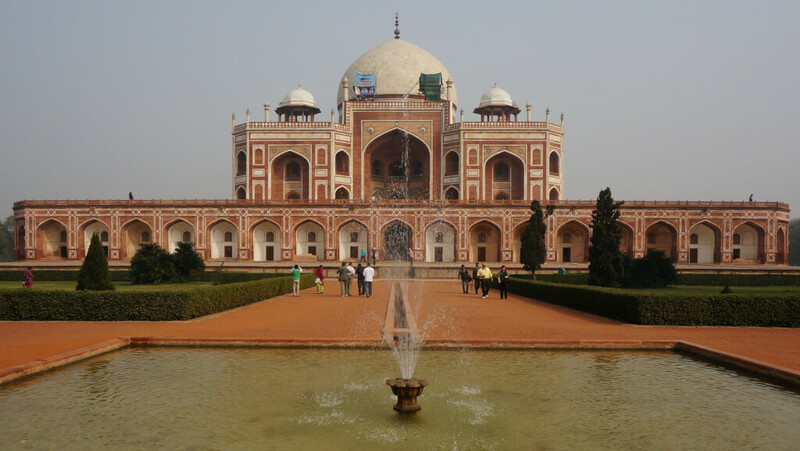 Humayun was the first to be buried in the mausoleum. After British took complete control over India, the garden in the tomb was redesigned to suit British needs. However in 20th century Lord Curzon ordered to restore the original garden. In a major restoration drive from 1903-1909; the tomb was restored close to its original shape. This also included lining the plaster channels with sandstone. During the partition of India in 1947, Humayun tomb was used as migratory camps for Muslims migrating to Pakistan. Finally another round of restoration work was done in the year 1993. 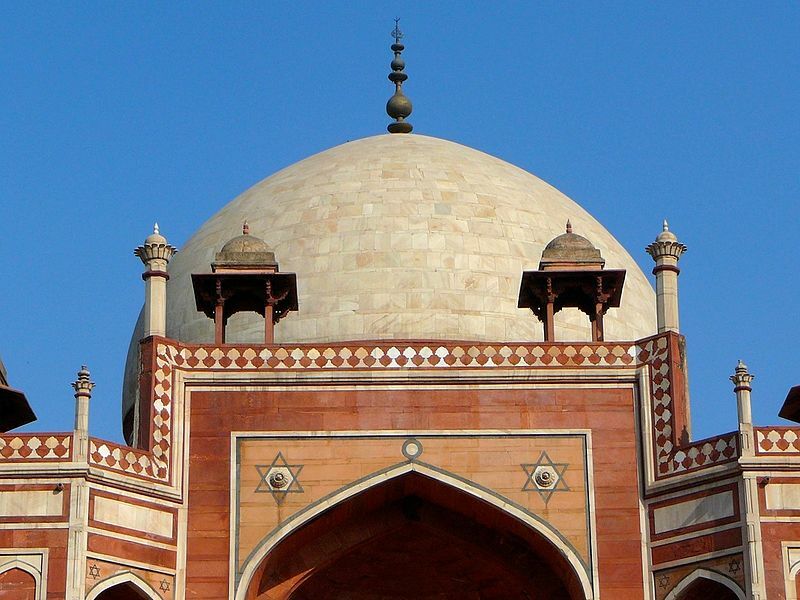 Another magnificent Mughal architectural with a blend of Persian style is the Humayun’s tomb. The tomb which is in the centre of the garden stands at a height of 47 m. There are various water channels for the fountains which adds more beauty to the tomb. It stands on a 7 m high stone platform. It is the first building in India to use Persian style of double dome and is topped by 7m high brass ornament ending in a crescent shape. 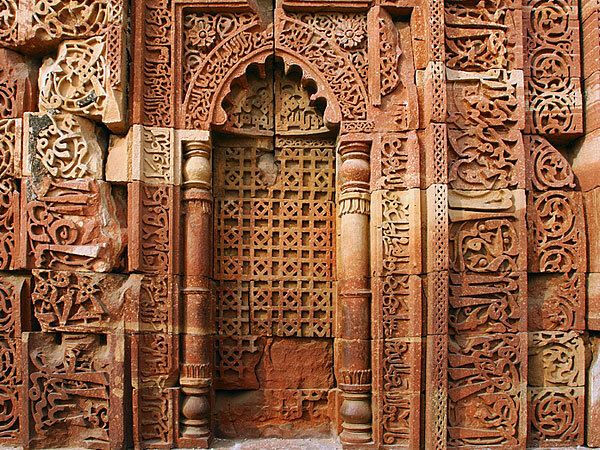 Built primarily in red sand stone and white marble the tomb stands for Persian and Mughal beauty. The height of the tomb is 47m and breadth is 91m. The domes of the central Chattris are beautified with glazed ceramic tiles. The domes are further beautified with white marbles on the exterior and the inner part gives an idea of immense interior space. While the exterior of the dome is white marble the rest of the building is built in red sand stone and white and black marble. Two double storied arched gateways paves way to the entry of the tomb. The central octagonal chamber contains the centoph which is surrounded by arched lobbies on the sides and octagonal chambers at the diagonals. The main chamber also consists of mihrab design over the jaali in the West facing Mecca. Instead of any inscriptions from the Quran there is just a small outline where light enters directly into the chamber from Qibla. The main tomb took 8 years to build. It is kept at the centre of the char bagh. The main chamber further has 8 smaller chambers. The whole tomb together consists of 124 vaulted chambers. Many small chambers also contains cenetoph which is present in many of the Mughal mausoleums. The most beautiful part of humayun’s tomb is the paradise garden which is in geometrical shape and is divided into four squares. There is a small chamber in the northern wall called as hammam to the eastern wall lies the baradari means a place with twelve doors. The humayun’s tomb also consists of several bulidings, tombs, mosques like Nila Guband, Bu Halima tomb and garden, Afsarwala tomb and mosque, Arab Sarai, Chillah Nizamuddin Aulia, Barber”s tomb, Bega Begum tomb. For sure it is one of the worth visiting places that I would recommend for tourists who visit Delhi. Timings: Sunrise to Sunset, 7days in a week.